The morning started early as we had an early bus to catch. We were up and out of our apartment before 4am. After a 20-minute walk, which included navigating down many flights of stairs in the dark, we arrived at the stop where we would catch our bus to the main bus terminal. The bus came…and went…never making a stop. Luckily there was another guy at the bus stop that spoke a little English. I was a little skeptical to talk with him at first since we were on the side of a very dimly lit street at ~4:30 in the morning. He helped us find another bus that was destined to the main bus terminal. Sylvie struggled for several minute trying to get on the bus since she was holding two bags plus our food bag and the narrow revolving gate proved a tad difficult. The bus set us back <$2 USD whereas a taxi would have cost~$20 USD. We arrived at the massive bus terminal, being the only two people remaining on the bus, and quickly found our bus company, went to a ticketing booth, and had our tickets printed for us. Although both people behind the desk spoke only Portuguese we learned that our tickets departed from a different bus terminal…F*ck (censorship brought to you by Sylvie). We asked if the terminal was close and he made a gesture indicating that it was not possible to get there in the 1.5 hours before our departure. After learning we could potentially change our ticket we went across the room and impatiently waited in the appropriate. This bus agency happened to have dozens of busses destined to Sao Paulo every day. However the only bus in the same class as our existing tickets did not leave until 9:45 (over two hours later). Since we only had 1.5 days in Sao Paulo I wanted to make the most of it. Also, Sylvie wasn’t feeling well (shocking as this is never the case). In all honesty I hadn’t slept more than 2 hours that night. I paid 2x our initial ticket price for “Leito” class, which was even higher than Executive class for the 7:30 bus. I was hoping that we’d get our own attendant, but we did not. We did however get a full reclining chair/bed that was most comfortable. Of the 6-7 hours bus ride neither of us were awake more than 60 minutes—now we could enjoy the city on a full day’s rest. I was utterly amazed at how simple the comprehensive metro system was. There were 13 lines, all connecting and with free transfers. Tickets were only 3.50 Reais ($0.90 USD)—I just learned that Reais is plural of Real. We took several transfers to get to our hotel. At our last stop we noticed so many people in Brazilian soccer jerseys…there must have been a game. Later that day during a subway trip a bunch of fans had actually broke out in song cheering on their team. The entire train seemed to be chanting. It was hot and humid during out walk. After dropping off our belonging in our room we take the metro to Liberdade Square—a Japanese portion of town that has a market every Sunday…(today was in fact Sunday). Brazil has a large Japanese population. 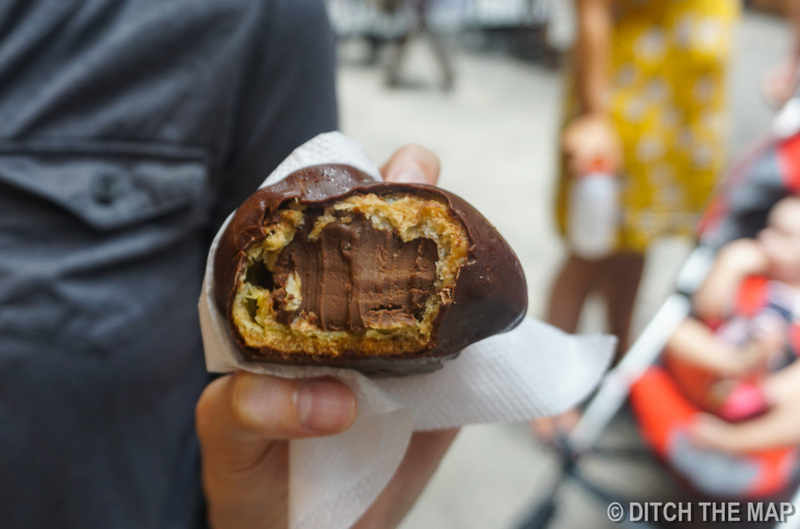 We tried various Asian dishes in the market and walked around for over an hour. 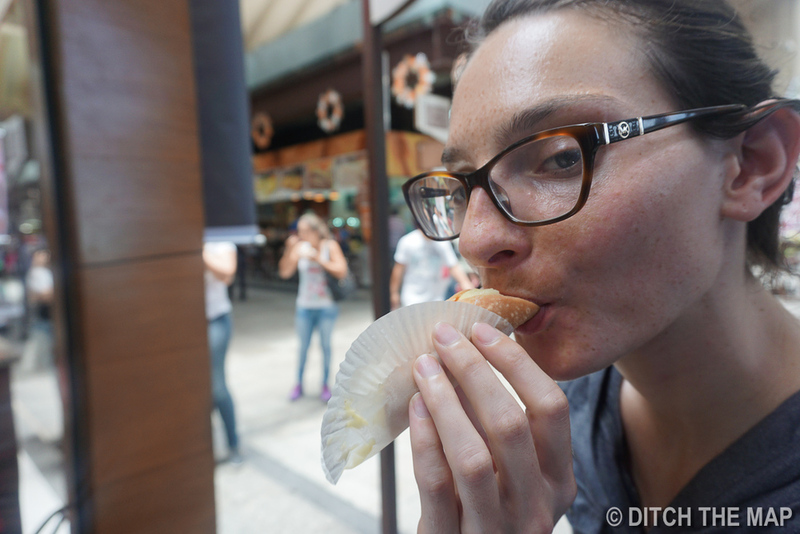 Sylvie tried a bean curd stuffed pasty and we split a port bao bun. We also were handed samples for vendors. To cool down on our walk back to the metro Sylvie enjoyed a creamy honeydew flavored popsicle. 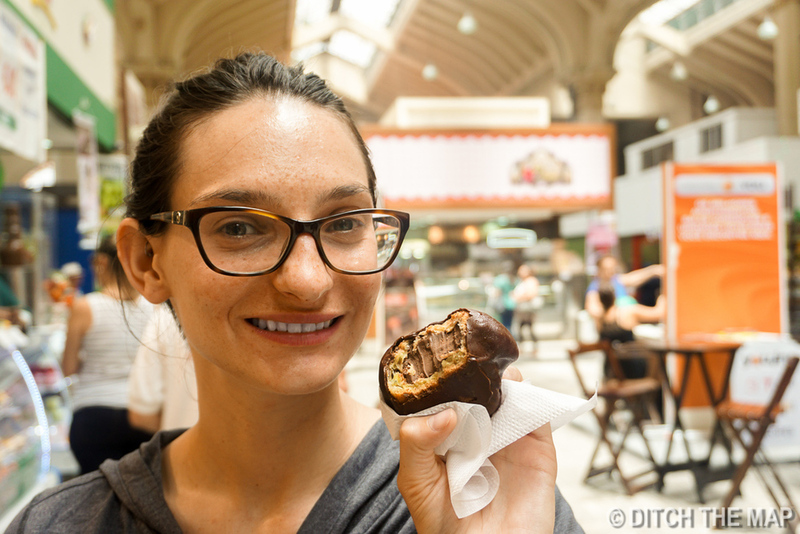 We took the metro to explore a region in central Sao Paulo. During our walk to the Municipal Theater we had to pass right through an ongoing death metal concert in a small alley. There was the distinct smell of pot and stale BO. Everyone was dressed in black and there was no shortage of tattoos and body piercings. Sylvie said that I we had gotten lost she would spot me because of my ‘pink shirt. After the death metal detour we arrived at the Municipal Theater, which was very pretty and was hosting a free concert for the evening. We contemplated going but decided against it. We were able to as a tourist booth for some information about our stay in Sao Paulo. After taking a nice siesta we set out in search of dinner. We walked down Oscar Friere Street and then down the famous Paulista Street. The first street is known for upscale retail shores and the second is known for being the lively part of town. Although we very much enjoyed the Liberdade portion of town we felt that it, along with downtown Sao Paulo, was quite run down. After seeing Oscar Friere and Paulista our opinion of the city changed. The city had such life. There were street performers, street food, small fairs on side alleys, tall buildings lit up with lights, fancy malls and cinemas…the works. For a Sunday evening at 9 there was so much activity. Sylvie had noticed quite a few gay and lesbian couples openly holding hands. This was a refreshing sight in such a traditional culture heavily influenced by Catholicism. Early in the night we had crossed a Japanese fast food restaurant that looked good to us. It was early in the night and I had wanted to see more of Paulista before committing to dinner. We walked down Paulista for 45 minutes and took in the scene. A jazz/rock duo performed on the street. She had two different saxophones and he had an electric guitar. He would solo for long stretches of time making use of all his 6 effects peddle. We ended up deciding on going back for the Japanese food. We took the metro back since we didn’t want to walk the 2 miles back. At the Japanese restaraunt one guy behind the counter said, “[they were] out of rice and will not have more for 40 minutes”. We walked down Augusta Street in search of an affordable meal. We saw pizza, Mexican, Indian, diner, etc., but in the end opted to go back to the Japanese place. It had only ben 25 minutes so we stopped into an Arabic fast food joint and each gotten a chocolate cone. I thought it was one of the best cones I’ve had since our trip began over 4 months ago. I’ve been keeping track of many things and the # of cones we’ve had is one of those things. Tonight we enjoyed our 78th ice-cream cone. It was so nice to have chocolate again. 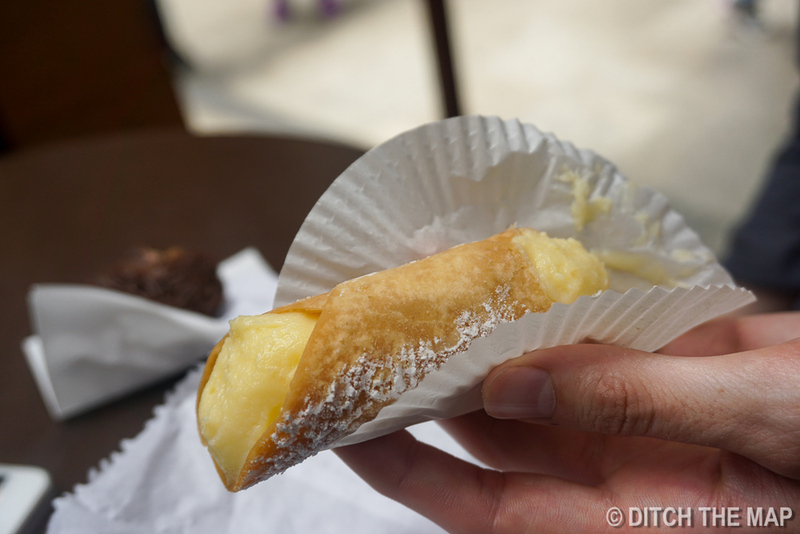 We didn’t come across many/any “conos” in chile/Bolivia and Argentina only had vanilla and dulce de leche. Brazil had vanilla and chocolate…jackpot! After another 15 minutes we walked back to the Japanese restraint only to discover that it was closing down. I can’t believe that guy said they would have rice in 40 minutes just to be closing down at that time. Ugh! We went back to the Arabic fast food place and bought a salad and a sample platter. Despite struggling for 15 minutes to order (they didn’t have much of what was on their own menu) the food was quite delicious. We finally arrived back at our hostel just before midnight—a long day that had begun over 20 hours earlier. I bought a zero calorie cherry soda and we opened and shared a drink at midnight in honor of Sylvie’s 26th birthday. Sylvie sang the song “Shots” made famous by LFMO as we drank the soda. 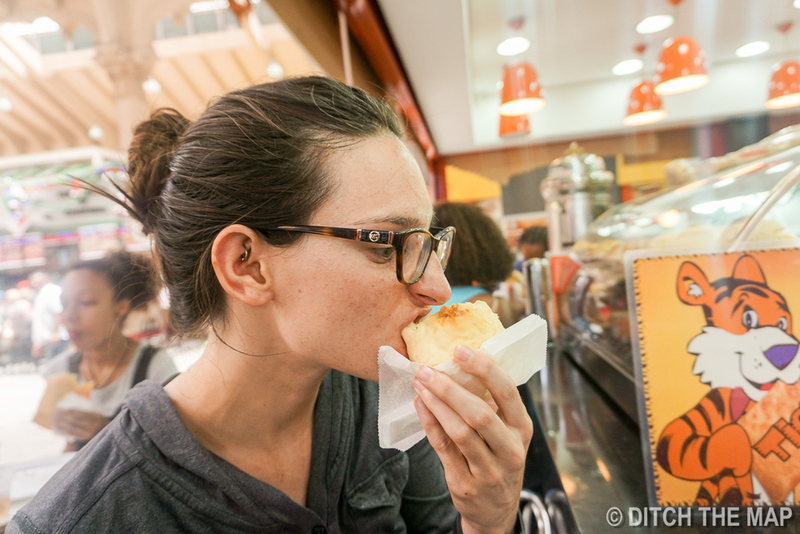 Sylvie has fallen in love with "pao de queijo", fried cheesy dough balls. She gets at least 2 a day and for her birthday her wish was to eat as many cheesy dough balls as she wanted without remorse- as she says calories don't count on her birthday. She wrote a song about her joy. After Sylvie sang her birthday song we ate breakfast at the hostel while planning out our day. After 3 metro transfers we had arrived at the Municipal Market—a very large indoor food market. There were restaurants and vendors. There were meats, cheeses, fruits, pastries, etc. Since calories don't count on Sylvie's birthdays she tried various fruits and Sylvie had 4 different pastries. Today had been extremely hot and even more humid. We walked back to the metro through a maze of street vendors and took another 3 transfers. Over an hour later we were at an upscale mall—we had planned to catch the 3:20 showing of Bridge of Spies with Tom Hanks. We were able to save half the entrance price using our student IDs. Sylvie had read that the movie was in subtitles but we weren’t sure. The movie had 10 minutes of opening scenes without any dialogue so we waited patiently eager to find out if the movie was in English…it was! After another 3 transfers back on the metro we were en route to our hotel. I spent over an hour running around the city trying to find a place to exchange my remaining Argentinian and Chilean pesos. Everyplace I found was closed except for one place that only exchanges USD and Euros. I was a little discouraged because I had ~$70USD remaining. I knew that my Argentinian money would become worthless outside of Latin America. Even here, in Brazil it was only worth 25 cents to the dollar. Luckily I found a place the next morning in the airport. I got $43 for my money (less than 2/3 of face value). We got changed quickly and went out to Brown Sugar, a trendy little Italian restaurant for Sylvie’s birthday. We enjoyed a nice meal and got back to our hostel before 11. We packed for the next morning and got to bed. We had planned on getting up around 2:50 but were slightly relieved to discover our flight had been delayed an hour. We set our alarm for 3:50 and got to sleep. In the morning I hailed an Uber. I signed Sylvie up for an account using my promo code. This was she got a $15 USD credit and after her first use I would get a $15 USD credit. We were told that it would take 1 to 1.5 hours to get to the international airport. It took us less than 35 minutes and cost us less than $10 USD. Sylvie checked her bags and I carried my on. It is nice that she was able to check them through all the way to Lisbon…I just didn’t want to risk the chance of getting my bags lost or delayed. After passing through security we entered terminal 3. We found out that the Centurion lounge was in a different terminal. We rushed to Terminal 2, which was over 15 minutes away. We had to go through another security checkpoint. We arrived at the VIP Lounges in Terminal 2 and eagerly searched for our lounge. There were no less than 6 high-end lounges but none of them were the Centurion Lounge. I went online and learned that it was in Terminal 1. Sylvie was heart broken…there is nothing she enjoys more than free pastries. We got back to our departing terminal and patiently waited for our departure. I watched Casablanca on the plane as I felt it was appropriate given our destination. Sylvie slept most of the ride. We are starting our decent and should arrive in Casablanca shortly.